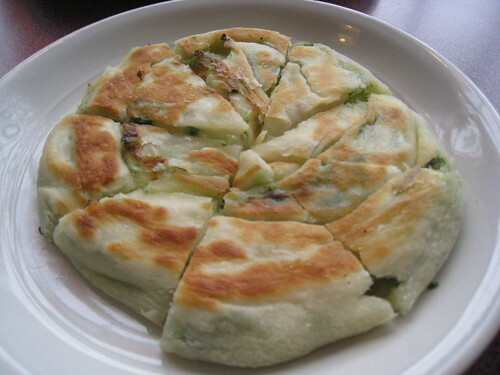 The green onion cake. Savoury, crispy and oh so satisfying, it is one of my favourite indulgences, but only when done right. I’m not a fan of the flat pancake-like versions at the Fringe that many others adore; my preference is for the doughnut-shaped cakes – airy, and really, with even more surface area to absorb hot oil, it’s on a different plane of existence. 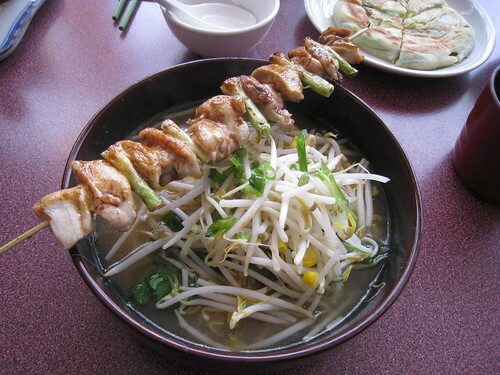 When I heard about Noodle Maker, opened by the man who is said to have introduced the tasty treat to Edmonton, my curiosity was piqued – what would the “original” green onion cake be like? On Thursday, another miserably cold day, Kathryn and I made our way to Noodle Maker for lunch. Just past the gates heralding Old Chinatown, it seemed to be a quiet afternoon for the restaurant – only one other customer to be seen during our visit (given how bustling the cafeteria in Canada Place is, I had to wonder how many people know this place exists). The interior isn’t much to look at, save the artificial cherry tree blooming from the take out counter, and an antique stove in the corner. The dated décor contrasted amusingly with the large flat panel television screen mounted to the wall (tuned to a Chinese news channel), and a shiny new Mac at the till. The menu features dishes from many Asian cuisines, including Chinese, Korean, Japanese and Thai(take a look here). I opted for a ramen bowl with teriyaki chicken ($8.50), while Kathryn chose the rice stick stir fry ($11). Of course, we also ordered a green onion cake ($3.50) to share. The green onion cake didn’t look like much, but looks were deceiving! While it was the flat version, pulled apart, there were discernable, flaky layers inside. With a crispy, salty exterior, we had to pull ourselves away to try our entrees. It really was worth venturing out for, and would be something I’d return specifically to order (we both agreed that the name of the restaurant really should celebrate their green onion cake instead). The entrees were good, but didn’t live up to their green onion cake counterpart. The butter soy broth and ramen were all right – broth not overly salty, and ramen well-cooked, but neither wowed me. I did like the inclusion of vegetables though – bean sprouts, corn, and spinach. The teriyaki chicken was probably the wrong type of meat to order (especially after reading Lillian’s review) – it wasn’t as moist as it could have been. 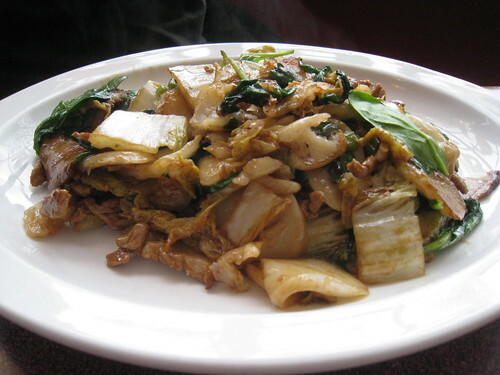 Kathryn enjoyed her stir-fry, noting that the rice cakes were very fresh, but like me, also kept returning to the green onion cakes. Noodle Maker has started a $7.67 “popular lunch express” feature for either dine-in or take-out, a great deal that includes a vegetable stir fry, a ramen noodle or rice bowl and two toppings (teriyaki chicken, tiger beef, pork ribs, shrimp, basa fish tempura). On January 18, 2011, from 11am-2pm, those that register on their Facebook page will be charged just $5. There are definitely a few more dishes that I’d be interested in returning to try. And given its proximity to the Arts District, it’d be an interesting choice for pre-show dining. Not that I’d need an excuse to come back for the green onion cakes.